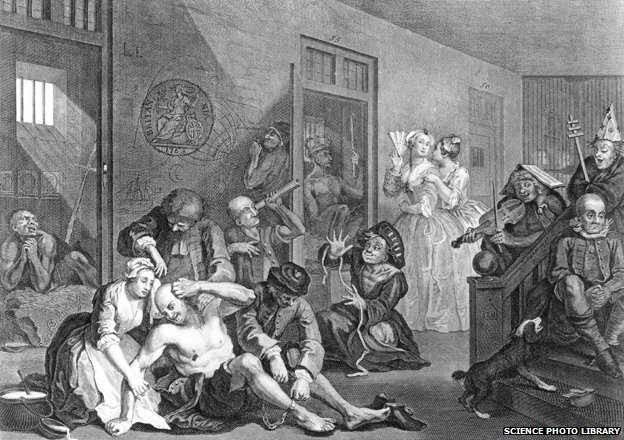 Words created “Bedlam” as depicted by Hogarth. * Words cast shadows on the truth. And the most powerful words continue to cast their towering shadows over centuries of mankind, shaping, influencing and imprisoning our entire human, cultural, psychological and especially spiritual, experience. * To find the truth of it – that which casts those shadows, it may be useful to gently and lovingly turn around, look inside for the projector as it were, for the source of that light…what is it that is looking? We may be graced to glimpse our timeless self-nature. * Grace can never be had for the wanting. * In truth, grace is often found in not getting what we think we want. * Indeed, real grace introduces us to our Self; to the actual and the factual nature of our source – our being. * Grace facilitates the instant seeing/letting-go of our conditioned and habitual suffering – the freight of our belief in words. * Beliefs are like fish swimming around in our head; seeing/letting-go happens when we “catch and release” those limiting thoughts in the moment, lovingly, without judgement. Therein lies the key to leaving our self-imposed prison – and yet another grace!